Hiring an interior designer for a home remodel or home interior design does not mean that you have to start from scratch. Our professional interior designers can work with your existing furnishings and accessories to create a totally new and fresh look for your home. 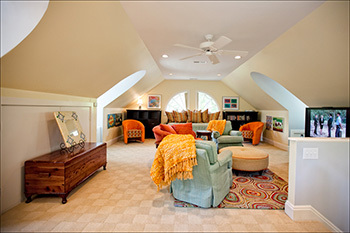 The team of interior designers at Marta Mitchell Interior Design can help you turn a kids room into an office, a spare bedroom into a craft room, or a basement into an entertainment room. Marta and her team have extensive experience with home renovations and home re-designs. We’ll show you 3D renderings of room re-design ideas so help you envision what the remodel will look like. Our home interior redesigns transform spaces into unique, creative, yet functional living areas.